Healthy and delicious, this broiled salmon with blistered garlic tomatoes is surprisingly fuss-free and simple! Meaty, rich, and wonderfully versatile, salmon has always been a favorite fish to cook with, especially during my personal chef days when healthy recipes were always a top priority. 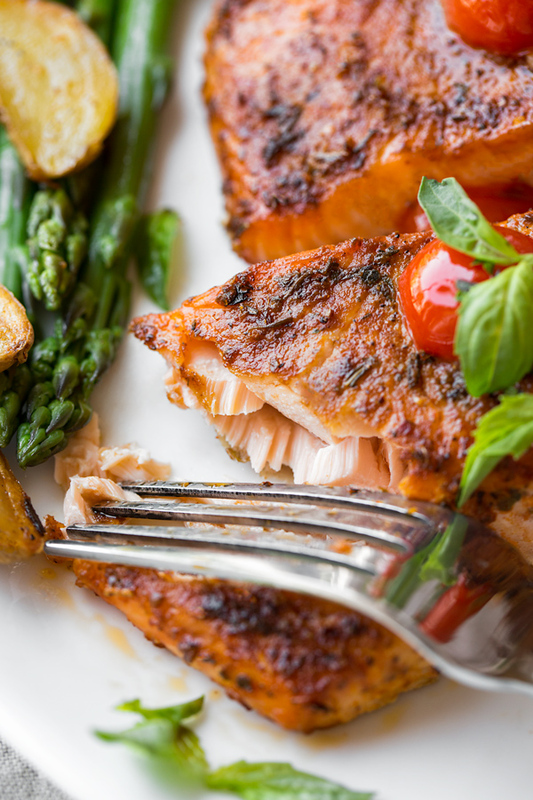 Salmon is loaded with omega-3 fatty acids, protein, vitamin B, and potassium, which is why it’s considered one the most heart and brain-healthy proteins one can enjoy. And because it wonderfully (and quickly) takes on the flavors of a marinade or dry rub like nobodies business, it’s also a pleasure to cook with as well! But probably my absolute favorite way to prepare salmon is to broil it, because this method is extremely fuss-free and easy—my favorite way to cook! Tasty broiled salmon truly requires only a generous sprinkle of seasoning and about 10-12 minutes in the oven. And if you really want to take the flavors up a notch, pair it with some pan-blistered tomatoes sauteed with garlic and sprinkled with basil, and you’ve got a succulent restaurant-quality broiled salmon recipe fit for either a special occasion or a quick week-night fix! I personally prefer to purchase skinless salmon fillets when I’m looking to broil, but you could certainly use a large fillet, or even slice that up into portions as needed, once broiled. I begin by drizzling a little olive oil over top, sadding some salt and pepper, some dried herbs (I love Italian seasoning for this recipe), a pinch or two of paprika, and perhaps even a hint of cayenne for spice; and if I have the time and desire a deeper flavor, I allow the salmon to marinate for about 20-30 minutes, though this is not absolutely necessary. I turn my oven’s broiler on high, adjust my oven rack so that it sits in the center of the oven, and allow the oven to heat up for a few moments. 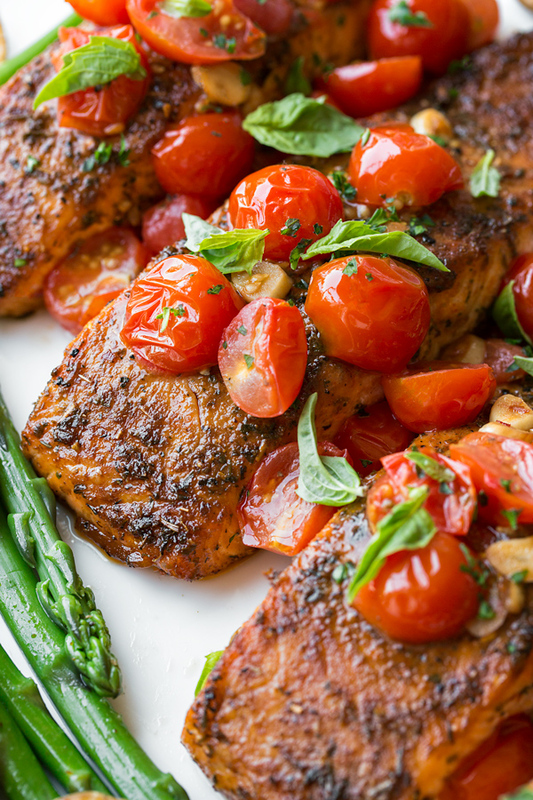 Place the broiled salmon onto your serving platter or directly onto plates, and enjoy just as it is, maybe with some lemon and your favorite sides, or with some blistered garlic tomatoes found in the recipe below! Skinless salmon fillets for ease: Choose skinless salmon fillets (about 6 ounces each) for convenience; or, have the seafood department prepare the salmon for you if only large pieces are available. Marinate for extra flavor: If you have an extra 20-30 minutes (you can even marinate overnight), allow the salmon to marinate in the seasoning to create a little extra flavor; however, this is not totally necessary. Put your broiler on “high”: If you have an option for your broiler settings, choose “high”, and adjust your rack to be in the middle of your oven, not too close to the broiler nor too far—you’ll create a nice crust with the higher setting. Good accompaniments: Feel free to serve your favorite sides with this delicious broiled salmon recipe. I love to go in a more “rustic” direction, so I really enjoy this recipe for asparagus and roasted potatoes (for which you can use either fingerling potatoes or yellow/red baby potatoes). 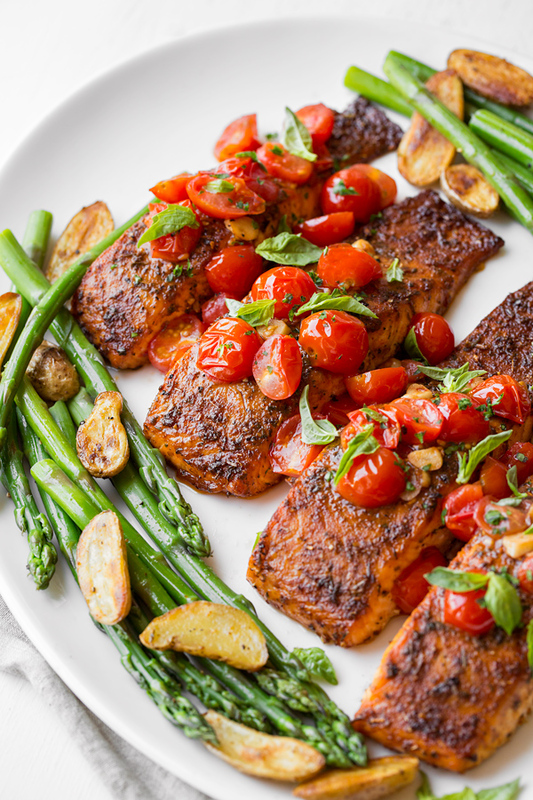 This succulent recipe for broiled salmon with blistered garlic tomatoes is simple yet flavorful, perfect for an easy week-night meal with some gourmet flair! –Adjust your rack to the center position in your oven, turn your oven broiler on “high”, and line a baking sheet with foil. –Place the salmon fillets on the baking sheet, and drizzle over about 2 tablespoons worth of the olive oil, a couple of pinches of salt and black pepper, the paprika and the Italian seasoning, and the pinch of cayenne, and rub the seasoning into the fillets. –Place the baking sheet into the oven for about 12 minutes, or until the salmon is cooked through yet moist and juicy. –While the salmon cooks, place a skillet over medium-high heat, and drizzle in the remaining 3 tablespoons of oil; add in the thinly sliced garlic and saute it in the hot oil for a couple of minutes, until it becomes aromatic and a golden-brown; remove the garlic from the oil carefully with a spoon, and place into a small ramekin to hold. –Into the same skillet add in the halved cherry tomatoes, along with a couple of pinches salt, pepper, and some red pepper flakes (if using), and saute the tomatoes in the hot oil for a couple of minutes until they begin to soften and blister, and become juicy; turn off the heat and add back into the pan the garlic, stir to combine with the tomatoes, and give a little squeeze of lemon juice; spoon the mixture into a bowl and keep warm. –When the salmon is cooked, place it onto a serving platter, and spoon over top the blistered garlic tomatoes, and sprinkle over the basil and parsley; serve with lemon if desired, as well as your choice of sides. Cook’s Note: This post has been updated with even more love! And new photos! This is my kind of meal! I love salmon! Have a great weekend! This salmon is absolutely beautiful. My mouth is watering just looking at it. I looove salmon! I could eat it every other day really. :D Looks delicious! This sounds and looks awesome, especially the tom/basil relish. Thanks, have pinned it for another day. 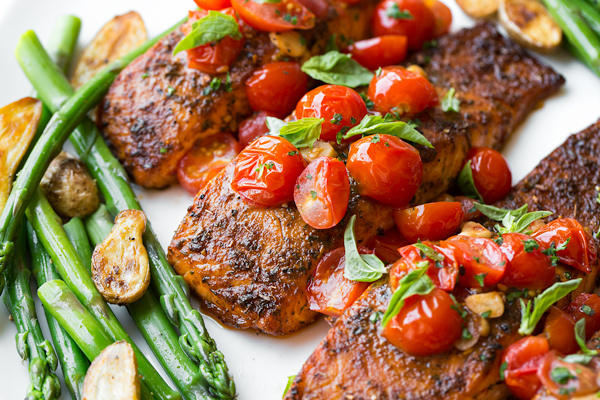 This salmon dinner looks amazing! Can’t wait to try it with my family! I made this for dinner this week and it was delicious! The tomato relish added a nice texture combination with the salmon and the lemon was a perfect addition. Next time I’ll have to make the potatoes and the asparagus with your recipe. Looking forward to trying some more of your recipes. Made this tonight for dinner! A Freakin Mazing!! Hi Mary, thanks so much for taking some time to come back and comment on your experience with the recipe! I made this tonight and my husband and I LOVED it. I bet the tomatoes like a bruchettta. Next time… Thanks! Hi Jody, thank you for coming back to comment on the recipe. I definitely agree that the relish would make a really tasty toast topper! Hi Iris, thanks for coming back to share- this is a good recipe to choose for a little dinner gathering, so I’m happy you all enjoyed it. Hi Alicia, thanks for coming back to share your experience—so glad you enjoyed this! I loved this dish! I made it yesterday!! That’s funny, Toya! Glad you enjoyed the recipe. I tried this recipe tonight and my husband and I both loved it! So simple to prepare and tasted perfect. 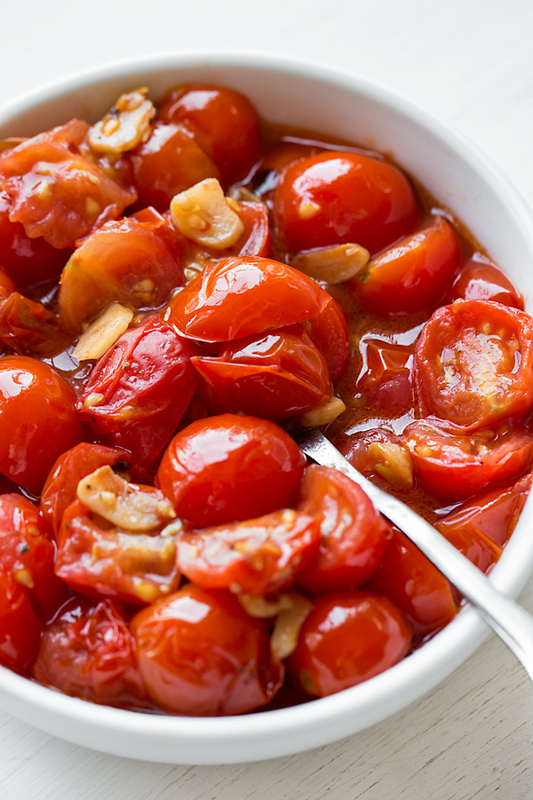 The blistered garlic tomatoes pair beautifully with the fish, adding some acidity and freshness. I served it with Couscous and Green Beans. Delicious! Thanks for the recipe. Made this today. Easy and delicious! Excellent, Evette – thanks for coming back to share! Beautiful! 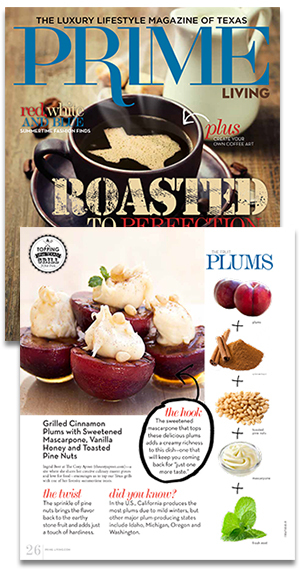 Love your site…..your recipes, your pictures, and your words!! I look forward to following you! Aw, that’s precious Kellie! Thank you so much for that. So glad you’re enjoying the blog! This meal was so AMAZING! Bistro with white tablecloth worthy! LOVE LOVE LOVE! Danielle, thank you for such kind comments – I appreciate that very much! And I’m thrilled that this recipe was easy to follow, and that you enjoyed it! I found your site though a friend on Pintrest and started wandering, I have this pinned to try soon since my boyfriend loves salmon. Question, have you tried this with any other fish? I’m not a big salmon fan myself but this sounds so yummy I’m going to give it a shot. Thanks for a wonderful blog. 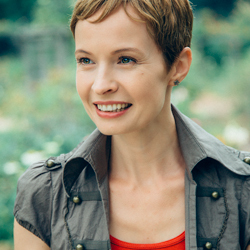 Hi Jennifer, and thanks for your comments! To answer your question about perhaps using another fish, you can always try something like Tilapia – more mildly flavored, and excellent for this. And I would pan-sear it for about 4 minutes per side at medium-high heat, instead of broiling. Hope you enjoy! I made this for dinner tonight and my husband couldn’t believe I made this. He is a chef, so it’s pretty hard to please him. This recipe is top notch, and besides prep, is really easy to make. Thank you! That’s wonderful! So glad you both enjoyed this, and I appreciate that you came back to share your experience! I’ve made this dish twice now and it’s by far the best salmon meal I have ever made. My husband, who used to be a chef, could not believe I made this. He is hard to please. Thank you for this amazing meal! This salmon dish was delightful–it literally melted in our mouths. My only change: I sprinkled the tiniest bit of sugar on top of the salmon before putting it in the oven. Thanks for the love and full bellies, Ingrid. This is a wonderful dish! I loved everything about it. The salmon was delicious. The blistered garlic tomatoes complemented the fish perfectly. This recipe will be in regular rotation at my house. Thank you! Hi Cyndi, thanks so much for letting me know the recipe was a tasty success! So glad you enjoyed, and that it’ll be a part of your meal rotation. Happy cooking! Donna, that sounds super tasty! So glad you enjoyed the recipe, and thanks for commenting!